If you are looking for one single “dashboard” page that summarizes this year's Tour de France and points you to the important stuff on the official site and elsewhere then here it is. The complete provisional starting rosters have been added at the bottom of this page and other details will be added as released. Of course, the mountain stages are of particular interest and Russell Standring of the Grenoble Cycling Pages, has put together a nice preview show of the three French Alps stages and last year, we filed an extensive photo and video Col du Tourmalet report which has easily become the most popular report posted on steephill.tv to date. The Team Discovery Channal site has a good video that captures their recon mission along the two Pyrenees stages as well. Unfortunately, I can't give the direct link but it's easy to find on their Race 2 Replace page. Follow the news and updates on the banned riders associated with Operación Puerto. Update August 5: Floyd Landis: Did he or didn't he? 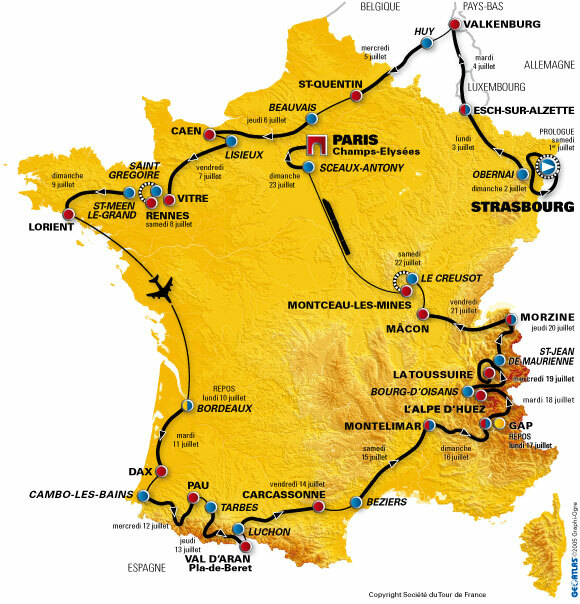 Running from Saturday July 1st to Sunday July 23th 2006, the 93rd Tour de France will be made up of a prologue and 20 stages and will cover a total distance of 3,600 kilometres. * 116 kilometres of individual time-trials (including the prologue). No team time-trial. Eurosport will televise stages and highlights. It's also going to be on ITV4 from 7-8 each night with live weekend coverage on ITV3.